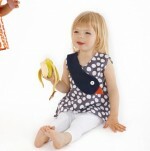 Deluna Kids’ Spring / Summer 2011 Beach Chic line is fun, playful and absolutely adorable! ‘Beach chic’ completely embodies everything that is delightful about sunny, beach vacations. Inspired by far-flung travel destinations and vintage pieces from the 70’s and 80’s, Deluna Kids’ new line brings back running shorts, harem pants and beach/play suits. All pieces are in bright, colorful prints that are sure to keep little beach bunnies looking stylish! Among the collection are bright vintage destination scarf tops made of 100% silk scarves that were carefully selected from markets across the UK, beautiful 70’s inspired Kimono Dress, Kaftan Dress, Pacha Playsuit and Swan Top. One of our favorites has got to be the Brighton Belle Dress. 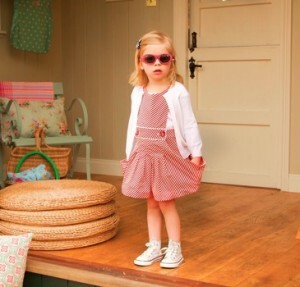 Definitely not your usual pinafore dress, the Brighton Belle Dress has oversized pockets for little adventurers to store treasures in, and the diagonal stripes and sweet buttons add some unexpected charm! So for your next beach vacation, check out Deluna Kids to keep your little beach-loving tot cool, comfortable and looking stylish!